Minister of Finance Neal Rijkenberg says without Value Added Tax (VAT) Eswatini can forget about renewable energy sources in the country. 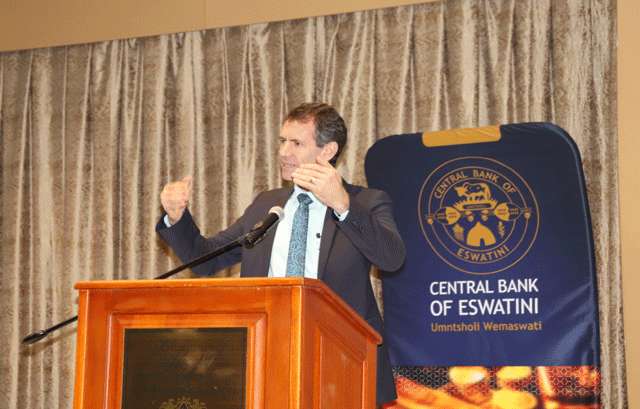 The minister was reacting to a submission made by Economic Association of Swaziland’s (ECAS) Professor Mike Matsebula during the Post Budget Seminar hosted by the Central Bank of Eswatini (CBE) at the Royal Swazi Sun yesterday. Matsebula stated during the seminar that the VAT tax would fall hard on the lower income earners and also promote inflation. He implored government to work together with other stakeholders to find other measurers for the level of electricity purchases. “We need to find other funds available to purchase renewable energy sources as this would ease the burdens that come with VAT on electricity. Maybe government can have a discussion with the local office of the European Union to see how they can assist the country in this regard,” he said. He also touched on the issue of fuel tax, in that it would create a negative impact and also see a regress in the economy. “I have no problems with the other levies, such as sin tax and all but I have reservations with the fuel tax. I believe it will give some resistance, especially considering the issue with the Cost of living adjustments (CoLA). Imposing this tax will just be a toxic mixture and government should consider,” Matsebula said. The minister explained that a majority of the VAT went to coffers of the Eswatini Electricity Company (ECC) and not government. He said this was mainly used to cushion the increasing electricity percentages from Eskom. “VAT does not have a negative impact on inflation and has a zero tolerance of the cost of goods. VAT also opens renewable sources doors for investors and as Cabinet we are working around the clock to find a balance. “On fuel, they may be an impact on inflation, but as government we need to find ways on how to make this easy on the tax payer,” he added.